Levy Art & Architecture is pleased to present “Reintroductions” by Todd Gilens, an exhibition of photographs and a newly commissioned installation. This show extends the Endangered Species Project that Gilens completed with San Francisco MUNI in 2012. The intent is to bring attention to our environment through fauna that are endangered, central to the San Francisco Bay ecosystem, and largely unseen by the local human population. The show runs from March 28th through June 30th; there will be an opening reception on Thursday April 17, 2014 from 6-9 pm. The installation will be in place for 6 months. 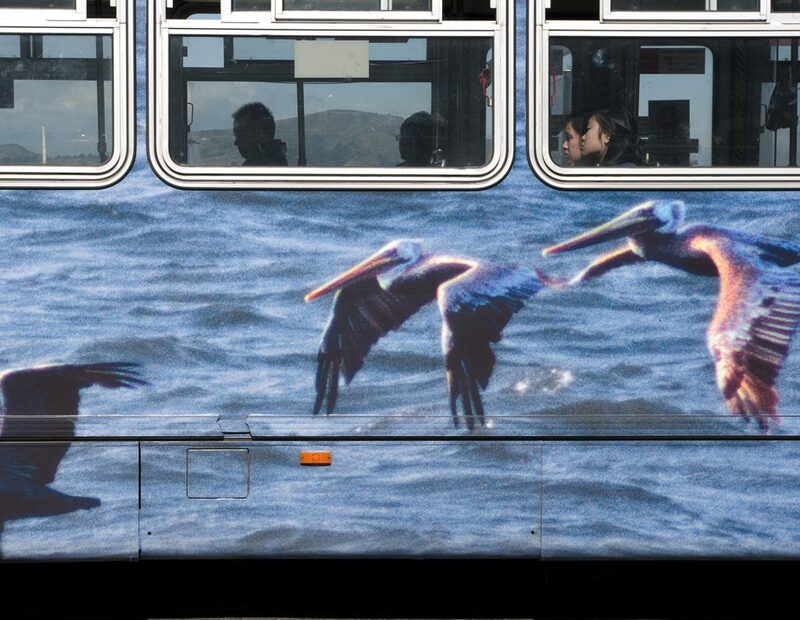 Inside the gallery are photographs based on Gilens’ 2011-12 Endangered Species project, in which he designed four buswraps for San Francisco Muni buses, each wrap an enlarged photograph of a local endangered animal. As these buses circulated from route to route, the artist followed them with his camera, on foot, by bicycle, car and motorcycle, photographing them all around the city. The photographs document the juxtaposition of the wrapped buses as they travel through the urban context. This is the first San Francisco exhibition of theses photographs. A new project commissioned by Levy Art and Architecture for the gallery’s facade extends this work by returning images of the Sacramento Sucker (Catostomus occidentalis) to Noe Valley. The LA&A studio is immediately adjacent to the historic course of Precita Creek, that these fish likely inhabited. The creek ran from Twin Peaks to the Bay shore, along what is now upper 24th Street, prior to the development of the area in the early 1900’s. This hundred and fifty square-foot print installed on the studio façade brings the fish back to an original habitat through our collective imaginations. The exhibition coincides with the 2014 “bio-blitz” a project sponsored by National Geographic and The GGNRA to discover, count and document the living creatures in the parks. Todd Gilens is a visual artist based in the San Francisco Bay Area. His website is Follywog.com.